Economist Paul Emrath of NAHB has updated a model he developed that estimates the value various features add to a home. The updated research paper and estimating tool enables builders, developers, prospective home buyers and home owners to see the impact that various physical features and neighborhood characteristics might have on the price of a home. Looking at location factors, the updated NAHB tool finds a general tendency for house prices to be higher in the Northeast and West, as well as in central cities and suburbs. Meanwhile, prices tend to be lowest for homes built outside of a metro area, though some regional variation exists regardless of urban status. Among other important findings, the estimator reveals that the greatest impact on a home’s value comes from adding a third full bathroom, which boosts the estimated price of a standard new home built in a Southern suburb by about $43,000. Meanwhile, eliminating the fireplace reduces the estimated price by about $24,000. If you're still adjusting baths at $2,000 and fireplaces at $1,500 . . . You MIGHT want to go back into the market to check those out!! Despite record low interest rates, renewed affordability and other seemingly positive factors, the housing market still faces unprecedented headwinds that will prolong its recovery. An expression frequently used to explain the problem is the “fundamentals are not there.” But what are the fundamentals implied by that rather non-descript and over used phrase? Do they include a couple of readily identifiable and measurable characteristics that are holding the housing market back or are the so-called fundamentals a series or combination of characteristics that make measurement more complex. Our view is the latter. While one or two characteristics may not have a profound effect on the broader housing market, considered together, the fundamentals add up to a serious impact. Here is our view of what those fundamentals are and how they are impacting housing recovery. Inventories are too highand are likely to remain that way for the foreseeable future. There are two types of inventory which impact or are at least destined to affect housing. They include both the visible inventory of homes which are capable of being identified and the so-called “shadow inventory” which is inventory held by banks and loan servicers which is not yet offered for sale. The biggest component of visible inventory is existinghomes offered for sale by membersof the National Association of Realtors. At the end of October, that inventory stood 3.86 million homes. That was down fractionally from a month earlier but still a 10.5 month supply at the current sales pace. Add to that about 242,000 new homes offered for sale by builders plus those offered for sale by owners and the visible inventory total grows to about 4.2 million homes. That is roughly where it has been for several months. Note that the inventory of new homes for sale is exceptionally small. Nevertheless, it still represents an 8.6 month supply at the current sales pace. Builders continue to have difficulty competing with exceptionally low priced existing homes. CoreLogic, a business analytics firm, reported in late November that the shadow inventory of homes increased from 1.9 million to 2.1 million units in August, the most recent month for which data are available. CoreLogic measures shadow inventory as loans where payments are 90 or more days past due; plus those in foreclosure plus those which have been foreclosed upon but are not yet offered for sale. That puts visible and shadow inventory together at about 6.3 million units which is well over a year’s supply and perhaps as much as two years depending upon how shadow inventory moves through the system. Shadow inventory is volatile and the forecasting risk inherent in both measuring it and tracking its movement is huge. For example, the volume of assets moving from foreclosure to bank owned status declined 35% in October. That is a direct result of well publicized foreclosure processing problems. These and previous moratoria have lengthened the timeline and have introduced even more uncertainty into the process. In our view, the shadow inventory may be the biggest single threat to housing recovery. If banks quickly return large numbers of houses to an already over-supplied and fragile market, prices will almost certainly decline further resulting in even more foreclosures and the cycle repeats itself. House prices remain unstable. While the free fall has ended (barring additional unforeseen eco-nomicshock) prices are still fluctuating within a narrow range. Nationally, the median existing home price in October was $171,100 little changed from both a month and a year earlier ($171,500 and $172,000 respectively). The S&P/Case-Shiller Index for the third quarter of 2010 was released on November 30th. Composite indicesfor both 10 and 20 cities are published quarterly. The 20 city index showed prices down 1.5% from the third quarter of 2009 and down 2.0% from last quarter. An important conclusion from the index is that U.S. house prices have generally returned to 2003 levels. Foreclosures continue largely unabated and the pipeline continues to grow. The Federal Reserve’s forecast of foreclosures remains grimfor the next few years. They expect about 2.25 million foreclosures both this year and next plus another 2.0 million in 2012. Foreclosures soared from about 1.0 million in 2006, the year home prices peaked, to about 2.8 million in 2009 when prices likely hit a cycle trough. Foreclosure inventories are now over seven times higher than long term historical averages and are continuingto rise. Moreover, as foreclosure activity increases, more six and 12 month delinquent loans are moving into foreclosure and the extremely delinquent category of more than 12 months continues to both grow and age. Payments have not been made in more than a year on one-third of all loans 90 or more days delinquent. Moreover, of loans that are more than two years delinquent, 18% have still not entered foreclosure. The reasons for such delays are not totally clear. The continuing pace of new foreclosure filings is also alarming. According to Realtytrac data, about 17% of filings in October were new filings as opposed to subsequent filings such as auction notices, etc. New filings surge to over one-third in Florida statewide and over 50% by the hardest hit Florida counties. The Congressional Oversight Panel that monitors the government’s bailout program issued a warning not to underestimate the reach of the foreclosure crisis. The panel also echoed the predominant view that the true extent of the problem remains to be seen. There is widespread concern that Congress could enact more legislation that may seem consumer-friendly on the surface but could have a profoundly negative effect on the mortgage industry and therefore consumers as a whole. For example, some lawmakers are attempting to resurrect so-called “cram down” legislation that would give bankruptcy judges the power to reduce mortgage amounts. Others are pushing for some big banks to spin off their mortgage servicing functions alleging conflict of interest. Still others advocate even more aggressive mortgage regulation at the federal level in addition to what is already being created under the Dodd-Frank and SAFE Acts. Whatever the depth or the out-come of the problem, the result is clearly a blow to a fragile housing market. Strategic Foreclosures continue to mount as a growing number of homeowners discover they are so far underwater on their home loans that they believe they will never recover. Strategic defaulters, as they’ve come to be known, may have the capacity to repay but choose not to. Some studies suggest that strategic defaults may account for as many as 25% to 35% of all defaults with no end in sight. They are driven by a very large percentage of underwater home loans. Employment is a fundamental which is currently negative for housing and recovery of the broader economy. The Bureau of Labor Statistics (BLS) announced last Friday that the economy created a mere 50,000 private sector jobs and lost 11,000 local government jobs for a net gain of 39,000 jobs and an unemployment rate that now hoversjust under 10% at 9.8%. The cycle peak was 10.1% in April. Currently the ranks of the unemployednumber 15.1 million, a number equal to the recession peak. More disturbing is that fully 6.3 million people have been unemployed long-term which is defined by the BLS as 27 weeks or more. Additionally, most of the Great Recession job losses have been permanent rather than cyclical and are therefore not likely to be replaced. The hardest hit sector has been construction. Manufacturing employment growth has been flat for decades and construction became, in a sense, the new manufacturing. It was employment for a very large number of both skilled and unskilled workers in their prime working years of 18-43. Now the construction sector has collapsed and nearly one million jobs have been lost. The outlook for a rebound is not good. Construction jobs were, in large part, driven by the housing bubble. As much of the housing growth was artificial and resulted in widespread overbuilding, much of the construction employment too was bubble driven and jobs won’t be replaced. The U.S. had a lost decade for jobs in the 2000s. Following the relatively minor recession in 2001, it took over four years to regain lost jobs. During that time, wages stagnated and The Great Recession struck. Wage growth remains flat and the period following The Great Recession is shaping up to be a jobless recovery as well. Job growth is not keeping pace with a growing labor force or a rising population. Indeed, there were only 400,000 Americans employed at the end of 2009 than were employed a decade early in 1999. Nevertheless, population grew by 30 million during the decade. The U.S. economy actually lost jobs on a percentage basis during the 2000s after having gained jobs every decade since the Great Depression of the 1930s. Roughly eight million jobs were lost during the recent reces-sion. That left a very deep hole for the economy to climb out of and jobs are not being created anywhere near fast enough to even begin the long climb. The nation’s unemployment rate has averaged 5.7% since 1948 — some 62 years. Given the structural employment changes that have occurred in the last three years, it is likely that the “new nor-mal” will be higher in the range of 6.5% - 7.5% after recovery. Unemployment, the fear of unemployment, the structural changes in employment, slow growth prospects and the likelihood of continuing stagnant wage growth combine to create a huge obstacle for potential home purchasers. These fundamentals combined will not support growth of housing either in terms of volume of home purchases and price increases r several years. Underwriting standards are frequently cited as a reason for impaired housing growth. The reality is that underwritingstandards have returned to those prevalent in an earlier time when there were no exotic mortgage instruments, cash down payments were required and a clear and convincing assessment of a borrowers ability and willingness to repay the loan were underwriting norms. Today, more borrowers are credit impaired than ever before and household wealth has declined dramatically from the heady days of the middle of last decade when people saw themselves as rock stars or oligarchs able to afford their every wish — at least on paper. These are a few of the fundamentals we often allude to. When combined, they paint a short and mid term housing picture that looks bleak. You are invited to the second of two FREE regression webinars hosted by David Braun, MAI of AVT. It will be August 25th at 2:00 EST. Click here to register. 2)	Click the following link to watch the video: http://automatedvaluationtools.com/media/Introduction_Regression_Analysis.arf This webinar is about 40 minutes long. FUSION, a low end USPAP compliant appraisal and report will be posted on the site very soon. It is free, but it utilizes updated verions of the Regression+ and the USL Documenter for it to run. If you purchased either of these products in the past year the updates are free. If you purchased over a year ago the update will only be $25.00 plus S&H. Also, an updated Total Solution will posted the week of August 16th. This will meet the recent FANNIE MAE required changes. This most recent Fannie requirement is better than using the cumulative listing count, but statistically has some issues. One sample from each period for the number of listings may produce unreliable results. The Total Solution for the 1004mc form is now a FREE download. I guess you will just have buy something else (ha ha). Two day seminar (14 hours with test, 12 hours without test) Prerequisites: This seminar requires that attendees have basic (beginner) knowledge of MS Excel®. This seminar is taught in a computer-lab setting. It presents a unique blend of theoretical knowledge and hands-on case study training. No need to bring your laptop or any software. Your computer will be provided as well as MS Excel® spreadsheet and a demonstration copy of “Regression+ for real estate professionals©” software. Understand how “least squares, straight-line” regression analysis works. Demonstrate an understanding of relevant statistical terminology. Understand how regression analysis relates to appraising and where traditional appraisal techniques and regression analysis overlap. Prepare data for analysis by “scrubbing” it in an Excel spreadsheet. Recognize the weakness (unreliability) of trending one property component at a time (such as sales price or sales price per square foot). Able to understand the underlying “assumptions” of regression and how to test that these assumptions have not been violated. Able to understand the reliability of the regression analysis results. 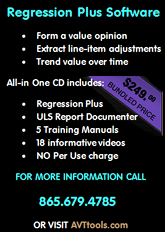 · Decide if adding regression analysis to your appraisal practice is right for you. If you are a user of appraisals; determine if regression analysis can meet your valuation needs.